On tankers equipped with a cargo pump-room, this is a potentially hazardous enclosed space. Pump alarms and trips, level alarms etc. should be tested regularly, and in any case before commencing cargo handling operations, to ensure that they are functioning correctly. The results of such tests should be recorded. Bulkhead glands around driveshafts between the pump-room and an adjacent machinery space should be checked and adjusted or lubricated as necessary to ensure an efficient gastight seal. During all cargo operations, including loading, the pump-room should be inspected at regular intervals to check for signs of leakages from glands, drain plugs and drain valves, bulkhead glands should be checked for overheating. In the event of leakage or overheating the pump should be stopped. No attempt should be made to adjust pump glands on rotating shafts while the pump is in service. No repairs should be undertaken on cargo pumps, their associated relief valves or control systems while the pumps are running. Pump-room bilges should be drained of any liquid that has leaked from glands, pipelines or valves; such liquid is usually transferred into a slop tank for contaminated liquids. Not only is this good practice for cleanliness and reduction of vapours within the space, but it will avoid the possibility of incompatible cargoes becoming inadvertently mixed. It should be possible, when alongside a terminal, to transfer contaminated liquids directly to shore reception facilities. Cargo pump-rooms, due to their location, design and operation, constitute a particular hazard and therefore necessitate special precautions. Cargo pump-rooms should be continuously ventilated during all cargo operations. To meet the requirements of the IBC Code, they must be fitted with mechanical ventilation systems controlled from outside. Because of the potential for the presence of cargo vapours, such spaces should be ventilated for at least 15 minutes before entering and operating the equipment inside. Only authorised personnel should enter and operate equipment in cargo pump-rooms. Leakage of toxic liquids and escapes of toxic vapours should always be suspected, because cargo pump-rooms contain a large number of flanges, valve glands, pumps and couplings. Because pump-rooms are enclosed spaces, the concentration of toxic and flammable vapours in their atmospheres might rise to dangerous levels. In the event of pump or pipeline leakage, the pump-room atmosphere must be tested for flammable and toxic vapours appropriate to cargoes recently handled, and the pump-room should only be entered if found safe. If entry becomes essential before a safe atmosphere is established, full personal protective equipment must be worn. Cargo liquids from minor leaks should not be allowed to accumulate in pump-room bilges. If left to lie in place, there is the possibility of unsuspected vapours from former cargoes being released when the surface of the bilge water is disturbed. In particular this could occur when a chemical which is immiscible with and heavier than water has lain under the bilge water. Additionally, when pumping out accumulated liquids there is a risk of accidentally mixing an incompatible chemical with other chemicals already in a slop tank.Some cargoes are not allowed to be carried in tanks served by conventional below-deck pump-rooms. 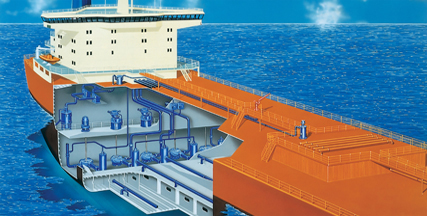 Those enclosed spaces in the cargo area that are not normally entered during the operation of the ship, such as ballast tanks, cofferdams, duct keels, pipe tunnels etc., may contain flammable or toxic vapours or be oxygen deficient. They must not be entered without a permit and only entered if proper ventilation of adequate capacity is provided. Proper procedures for entering such spaces must be established and adhered to.